Madeleine qualified as a lawyer in 1990 and became a partner in a large law firm in the UK in 1994 specializing in discrimination law. 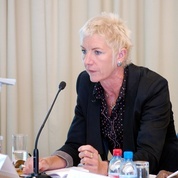 Madeleine brought cases both to the European Court of Human Rights and The European Court in Luxembourg. In 1998 she began working for the Office of the High Commissioner for Human Rights as the gender expert and Head of Office in Bosnia and Herzegovina. In that capacity she worked extensively on the rule of law, gender and post conflict, transitional justice and the protection of social and economic rights. The Office in Bosnia was the first to take a case of rendition to Guantanamo before a court. The OHCHR office dealt extensively with the issue of trafficking and Madeleine was a member of the expert coordination group of the trafficking task force of the Stability Pact, thence the Alliance against Trafficking. From September 2! 006 to April 2010 she was the Head of the Women`s Rights and Gender Unit for the Office of the High Commissioner for Human Rights, focusing on using law to describe the different experiences of men and women, particularly in post conflict situations. She is now the Secretary General of Women's International League for Peace and Freedom.